Ok, let's roll this review a different way. I handed over $4.16 for a double scoop, picked myself a seat staring out the window and realized a few things. Worst Part: The fudge swirl, it was totally off, almost an alcoholic bite to it. It was unpleasant. Thankfully it only ruined a few bites. Best Part: The bites that have the fake M&Ms in them. They are full size (M&Ms) and when their chocolate mixes with the complex texture of this ice cream, it's pretty awesome. Unfortunately their presence is limited, I think I had 6-8 of them. Random Part: every now and then you get a blast of sweet sweet caramel and it makes for my second favorite bite. I wish there were more of these as well. Pretzel Part: Pretty sure Marvo wouldn't like this ice cream as pretzels play a big factor. There is a never-ending grit and saltiness to the ice cream. I do love when an ice cream can deliver a unique texture, but the whole time I kept thinking "is this freezer burned a little?" HAHAHAHA, I just had a random thought. Just like the ice cream has "everything" in it, it pretty much has all my feelings in it. Some awesome bites, some terrible bites, and then a bunch in between. I don't regret trying it, but I do regret not trying it earlier so I could help temper your expectations. I'm not sure what else to say. I do wish I had eaten it a bit slower. It's still a fun ice cream at times but many bites just seemed off to me. I just didn't want this particular variation of a caramel base, or maybe the mix-ins threw off the base. I like the idea here, but it just didn't come together quite right. Maybe I'm to picking... or maybe this one just needs an even bigger sequel! 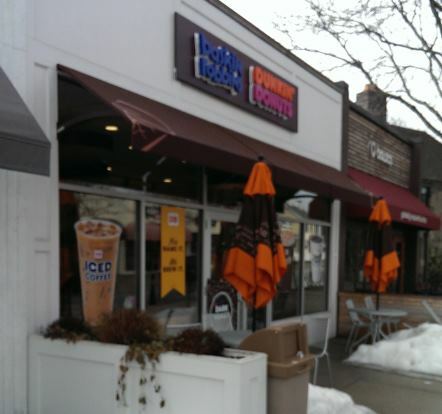 **For those in the area, a new DD/BR is located in downtown Wellesley! For those not in the area, Wellesley is a bit of an affluent area... so much so that one of the local radio stations mocks their police blotter on a weekly basis (you can listen here). Oh, I tease, I tease, I use to pass through town quite often a millenia ago and they have a neat center of town lined with stores and restaurants. I wouldn't mind walking around for a bit, but after successfully parallel parking for the first time in forever, I needed some lunch! I was wondering how you guys would feel about this one. I tried it about two weeks ago and was very unimpressed. All the mix ins overpower the ice cream until you have nothing but a sugary mess that tastes like everything and nothing at the same time. I don't know if there were pretzels and chips in mine because I couldn't taste any of them. A hint of the caramel ice cream came through here and there, but it was way overpowered by the chocolate fudge. The occasional candy piece was nice to find, but was nothing short of a frozen M&M. So much going on in this ice cream, yet too much at the same time. Disappointing. Also, mine had a yellow ribbon cut through it that looked of mustard, but tasted like sugar. Still not sure what that was. the salted pretzel ribbon maybe? always glad to here I'm not alone, but at the same time, I would like someone to go "no, your batch doesn't sound fresh". Oh well. They tried, but I shouldnt havent gotten so excited about it. Might have been...That would explain the hint of salt I got here and there (Which I forgot to mention above). I'd love to tell you that you're wrong, and that you got a bad batch of ice cream. First and foremost, that has to happen. I actually wanted to try it again after this review and my two cents in the comments - I don't know why. Glutton for punishment maybe? As you know, I was dying to try this one and actually tried it twice in about a 3 day span. It wasn't bad, but I share the feeling that it wasn't what I hoped for. To me, the pretzel and chips got lost and, as Dubba said, the best part were the M&M like inclusion. 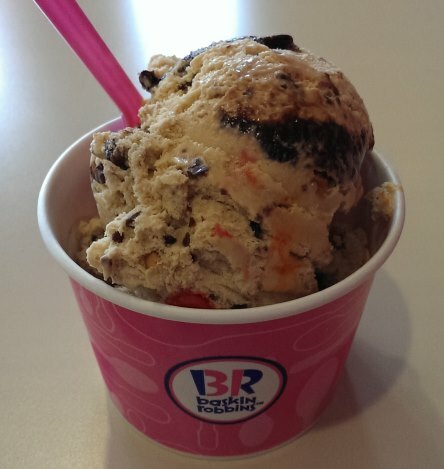 guess i don't have to feel so bad for not being able to try this (no baskin robbins here). although, i really wanted to try it! it sounds like it would be perfect, but it seems like they just couldn't deliver. Tried it again...Yeah...Sticking to my initial review. @TTB: Bahahahaha. Guess I wont bother trying it again when they have $1.31 scoops on 3/31. Nah, not worth it even for $1.31. Way more flavors available to enjoy at that price. @TTB: I was thinking of trying that green Easter Egg Hunt flavor next week, seemed appropriate. Yes, yes and more yes! That flavor looks awesome. Not sure what the eggs are inside of it - Hopefully sweet, and not sour. Can't stand Sweet Tarts, and that's kind of what they look like.